Since I travel a lot and own both a cat and a dog, I’m often asked what happens to them. Do they travel, too? I’m a huge believer that both pets and children can be great travellers if exposed early enough and done the right way. When I first got my cat Grace, I lived in a studio flat on a beautiful tree-lined street next door to a park. So I put her on a leash and took her out for daily walks just to expose her to different sounds and situations. And since I didn’t have a car, I’d have to take her to the vet on foot which I did by putting her in a large cage that I carried through the city streets – again so she could see everything and get used to noises. She actually seemed to enjoy the outings, especially since she is 100% an indoor cat. She can do long car trips and actually loves being in hotel rooms (she explores then cuddles in). My dog Jack, however, was different. Spending the first 10 months of his life in a shelter, he had no idea about the outside world, being a dog, or how to walk (his back leg was gimped at first from sitting so much). The day I brought him home, he had no idea how to get into the car and I had no idea how to coax him in! I tried for about half an hour until one of the shelter people came over and helped me literally push him in. He was terrified of the car (sat curled up and panted heavily), terrified of people, terrified of going anywhere. And since I travelled a lot and wanted a walking companion, that would have to change. I took him to AKC’s Canine Good Citizen classes at the Dog Boys Ranch in Austin TX. I also boarded him there a lot and had him do a lot of day visits just to get used to being social and having the training reinforced since the trainers also worked the ranch. I also took him on lots of day trips in the car to get him used to driving and I took him to shops (he has spent a great amount of time at Anthropologie!) and places that allowed pets to get him used to being around people. All of that along with a lot of patience, Jack has become an amazing traveller – a fabulous walker, happily gets into the car and even sticks his head out the window to boot! Now that Jack is Canine Good Citizen certified and has had a lot of exposure, having him stay in hotels hasn’t been a problem. At first, he’d do quiet woofs when he heard people walking past the door but through training and lots of hotel rooms, he no longer does this. Bringing in his certificate to check in desks, I’ve had a lot of hotels forgo the “nightly pet charge” they sometimes give. Although I tend to stay either at Kimpton Hotels or Four Seasons – both of which are very pet friendly, have no surcharge and provide treats. But having him certified and knowing he’s a great traveller, I can stay at B&B’s or house rentals with ease. The trick with cats is to give them space and not make them feel confined. Cats are curious and if they can’t see what’s going on, they get even more nervous. 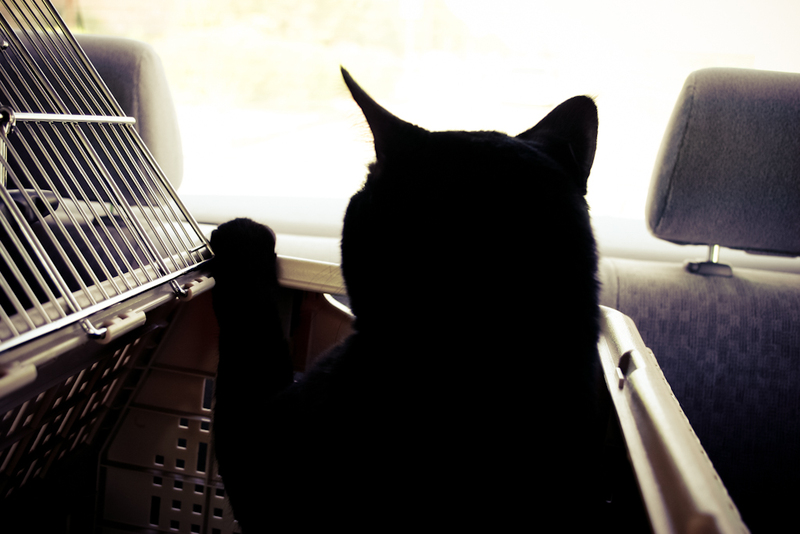 I bought the most fantastic cat carrier – the Fold Away Pet Carrier. It’s huge, spacious, has a top and side door and folds down for easy storage. Grace can see out and she can stand up in it (she’s 15lbs!). When I stop, I open the top part of the cage so she can stretch and I can pet her. Makes us both happy. Also, I always have The Mysterious Purr Pads on hand. I don’t know a cat yet that can resist them; they give a cat comfort. They fit nicely into the carrier (I put layer of paper towel under them in the carrier in case Grace has an accident whilst travelling. Easy clean up, then I just put in a new purr pad). Use them especially at a vet on the table as cats hate cold and those vet tables are always freezing and slippery. One of these (or a towel) will keep cats mellow. They also provide consistency, so when travelling Grace knows where to sleep when we get to a hotel (and it keeps hotel room furniture/bedding fur free). For food, I use two Pet Travel Tainers from the Container Store. It’s an easy way to carry their food and comes with two dishes for food and water. In the car, I use a blanket on the back seat for Jack and then when in the hotel, I bring it in. Again this helps with the consistency of him feeling at home but also protects bedding at hotels. When on the road, I really monitor temperature. I’ve been doing a lot of driving between Los Angeles and San Francisco since September (six hours) where the average road temperate is over 100F. If the sun hits the window directly onto the pet, no amount of AC is really going to help. So I make sure to block windows with blankets or keep the cage out of the sun. I also try to leave early in the morning or late in the day to avoid mid day heat/sun. I make sure pets have lots of water. The Gulpy is my favourite thing for Jack because he overheats so quickly and this provides me with an easy way to quickly give him water. I keep his in the fridge so it’s always cold (and helps cool him down). Stopping at every rest stop is crucial not just for the pets, but also for me. It allows us all a chance to stretch, chill out, get water – even if it’s just a 5 minute stop. If your pet is prone to car sickness, this can really help. Also finding the straightest route will too. I once drove with Jack along Big Sur Highway 1 in California and two hours of twists and turns was just too much for this otherwise perfect traveller. I learned to avoid that stretch of road with him. The Dog Lover’s Companion to California: The Inside Scoop on Where to Take Your Dog has been a huge life saver for travelling. You can find these books for your city or area but the California one was been my go to since I have been travelling it heaps. It has been accurate in describing dog parks (especially in finding off-leash parks whilst on the road), helping me find fun activities to do with my Jack (from riding trains to ferries) and has helped a lot with hotels in small places. I was doing a road trip in Northern California on a hot day and wanted to stop at a lake, which the book said had no dog friendly areas. A quick stop into Visitor Information and I discovered a newly opened dog beach so that Jack and I could take a swim. Since dog laws change quickly (dogs get banned from parks and then a new park opens up), local Visitor centres can be helpful as well. And most important, I keep both pets tagged. I have my phone, email and city on both their tags plus with Jack, he has his shots tag so there’s never hesitation when he’s staying somewhere about him being vaccinated. Both pets are electronically tagged (Grace has a tattoo, Jack has a micro chip). Keep this info up to date so on the off chance your pet goes missing, you can get them home safe and sound. I think that you and your readers will get great use out of a new resource: PAW;Pet-friendly Accommodations Worldwide on the web at http://www.luxurypaw.com. PAW is the only online pet-friendly hotel booking engine that exclusively caters to luxury, pet-friendly hotels. PAW only features 4-star or higher rated pet-friendly hotels from which to choose and book your hotel stay. It’s a great resource for people who travel with pets and want a pet-friendly hotel with a nice level of amenity!! This is great information – thanks so much for sharing. Have you ever traveled internationally with your pets or know someone who has? Can you recommend any great companies to use for this? hi alex! i know you travel quite a bit internationally — do you take your pets with you then, or board them? if you do take them with you, do you have tips on how to make it easier on the pet? i have a cat and will need to take her across the ocean in the future, so experienced advice is welcome. thanks! Grace was born in Canada so that’s not really international but crossing the border with her, I had to have all of her paper work up to date and it was a rather quick process. I have flown with her once and I paid for a first class ticket. My reasoning was that when you fly first class, you get treated a lot better and can get away with taking on more. I had a smaller carrier for her so I could take her on. First or business is hardly ever full and there is WAY more room. So I was able to fit her underneath the (unused) seat next to me and whilst flying, bring her up and sit her next to me. This was a relatively painless experience. I’ve heard too many horror stories about putting pets in cargo. If you have to do it, do some google research about different carries, don’t fly when it’s really hot or cold, don’t do connecting flights etc. But it’s really one of the most traumatising things for a pet. Even though business or fist might be expensive, it’s worth it if you have a cat or small dog. It’s just more relaxing for everyone, more space and less full means less noise/stress to the pet. Or consider buying to coach tickets side by side so you have extra room next door. As for European travel, I plan to do this with Jack but I’m going to do the Queen Elizabeth II ship from NY to Southampton. They have luxury kennels on board and you can visit your pets. I’ve had a few friends go this route and it was a great experience (and they have a lot of deals). The great news about Europe is that most counties now to NOT quarantine pets! So as long as you have all your paperwork showing their shots/vaccines are up to date, then you will generally have no problems. I have friends who travel all over Europe with their dogs and haven’t had issues. Ugh. We are moving from TX to Singapore in January and I am having a mild panic attack about shipping my pet. She’s a St. Bernard…I don’t think we can bring her on the plane since she’s 130 lbs and not exactly “under the seat” size. Any suggestions you’d have that I can look into would be great!! Thank you for this! It is a very timely post for me as I am getting ready to relocate from Philadelphia to Phoenix and am very anxious about bringing my cat, Ginger, on the plane with me. I have been researching soft carriers so that she will fit on the plane under the seat. My heart would break if I had to cargo her!